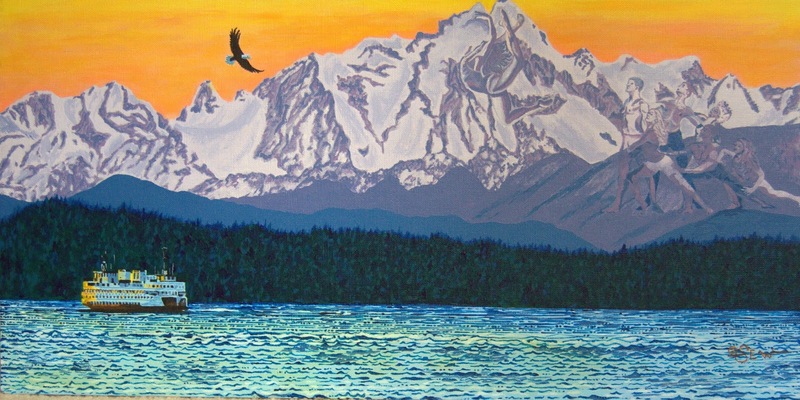 Art-a-Day: The Olympic Mountain Range, WA State Ferry, Bald Eagle and …. The Olympic Mountain Range, WA State Ferry, Bald Eagle and …. Can you spot the seven hidden dancers? They are not the focal point so you might miss them if you don't look closely. I finished the painting on 01/28 and have already started the first layers of paint for my next one. It won't get finished in time for the Art-A-Day, but I will keep doing art each day all the same. It was fun. Everyone did such cool things. There is a lot of talent out there. Thank you for inviting me and thanks to all who shared. Please "like" my page on Facebook. I am trying to get my work out there and that is not an easy thing to do. Great dancers, light and mountain ocean scape.